If you have spent any amount of time working with advertisements - especially Google AdSense - you will be familiar with the two terms: Page RPM and Impression RPM. Google AdSense is a very popular advertisement program that works on either a per-click or per-impression based model, and you often come across terms such as CTR, CPC, CPM, RPM, and so on. Today, we'll talk about the basics of these terms and then see how Page RPM and Impression RPM are different from each other, because they're often confused as one. Let us take a step back first and see whether we understand the very basic terms used in advertising. Page view - A page view is registered every time a user opens a page on your website. It does not matter how many ads are there, it will only count as one page view. Impression - This is a somewhat confusing term. Impression is defined as the user-view of a particular item on your website. It could refer to a user viewing a particular webpage, a particular ad unit, or an individual ad. Hence, an 'impression' can be sub-categorized into a page view, a page impression or an ad impression. Page Impression - A page impression is the same as a page view - at least when talking about Google AdSense. Ad Impression - An Ad impression is registered when an ad is viewed by a visitor. If a page contains multiple ads, then one page view may result in multiple ad impressions. For example, if a page with 2 ads is viewed 3 times, you get a total of 3 page views and 6 ad impressions. Query - An ad query is a request made to Google AdSense's system to display an ad unit whenever that ad is displayed. Both of these metrics are important when it comes to calculating your AdSense revenue. Both are very similar to each other, so it is only natural to confuse between the two. Let us explain what RPM means first. RPM (Revenue Per thousand iMpressions) is quite simply the amount of estimated revenue you will earn for every thousand impressions. It is calculated by dividing the total estimated earnings by the number of impressions, and then multiplying the result by 1000 (since the count is per thousand impressions). Remember: Impression here can refer to a page view, an ad request, an ad query, or an individual ad impression. Impression is a broad term encompassing all these metrics. Suppose, for example, that you have earned an estimated $10 from 5000 page views (page impressions). Your RPM would be (10/5000)*1000 = $2 for every 1000 page impressions. Page RPM refers to your RPM based on the number of your page views or page impressions. 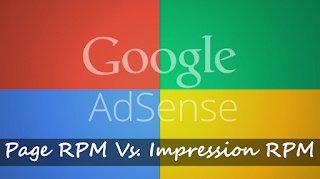 Impression RPM refers to your RPM based on the number of individual ad impressions you get. Although Page RPM is the more commonly used metric, some advertisers do bid on AdWords for Impression RPM as well. Typically, Impression RPM is lower than page RPM owing to the fact that one page may contain many ad units. That is, however, not necessary and you could be counting the total number of ad units or just one particular ad unit. The bottom line is, both these metrics are used widely and it can pay off to know the differences between them and how they are individually calculated. This is exactly what I have been looking for.You`ve explained way better easy to understand. Thanks!! Your website appearance is really awesome!!! how to add google ads in my blogger? Thank You found the best explanation of these very confusing terms. Though I wanted to ask that if there are no clicks and we got around 1000 impressions then will we get an amount equal to RPM?